The best ways to find rare species in Pokémon Go. This Pokemon Go Rare Pokemon guide will show players how to get rare species of Pokémon in Pokémon Go. Characters like Gyarados, Snorlax, and Lapras are among the rarest species currently available in the game. Other well-known legendary Pokémon, such as Mew, have not become available in Pokémon Go just yet. In Pokémon Go, your trainer level greatly influences your ability to find high quality Pokémon. As you level up, you should start finding a better range of wild Pokémon with higher CP. Ideally, you will want to find Pokémon who are already in their evolved form so that you can conserve their Candy for power ups instead of evolutions. There’s no sure-fire way to guarantee finding a rare Pokémon, but there are steps you can take to improve your chances. Most Pokémon can generally be found in climates that match their type. For example, water Pokémon are usually found near real-world bodies of water. You may not directly find a Gyarados or Dragonite at the beach or lake, but you might find enough Dratini or Magikarp to make their evolutions happen. Pokémon can still spawn elsewhere, but there does seem to be some correlation between climate and Pokémon type. Some Pokémon are also region specific. Tauros can only be found in North America, while Mr. Mime, Farfetch’d, and Kangaskhan are specific to other countries. Check out our guide for a better idea of where to search for certain types of Pokémon. Rare Pokémon can also be hatched from 10km Pokémon Eggs. Each Egg has a designated distance that the player must travel in order for the Egg to hatch. This distance also determines the rarity of the Pokémon inside the Egg. Rare species, such as Hitmonlee, Snorlax, and Lapras have been known to hatch regularly from 10 km Eggs, along with several other rare Pokémon. If traveling to special areas proves ineffective, then 10km Pokémon Eggs are the next best option for finding rare Pokémon. If you are specifically after a Gyarados, then you may need to prepare for a bit of grinding. Gyarados is not available from any Pokémon Eggs, so the only way to obtain Gyarados is to evolve a Magikarp. However, this is easier said than done. 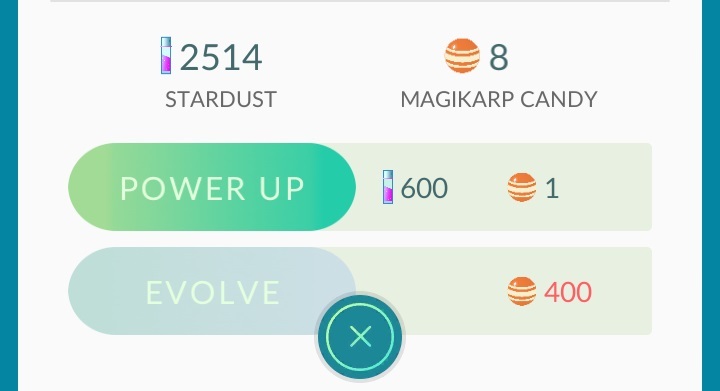 Evolving Magikarp in Pokémon Go requires a whopping 400 Magikarp Candy. This is most likely to imitate how difficult it was to evolve Magikarp in the previous Pokémon games. Evolving Magikarp in Pokémon Go can become a much more daunting task for those who don’t have a consistent Magikarp spawn nearby. If you can’t catch enough Magikarp, try hatching Magikarp from 2km Eggs. The upside is that these Eggs have a short travel distance, meaning you can hatch them more frequently. The downside is that these Eggs can hatch with a number of other Pokémon other than Magikarp, making the process a bit more tedious. Thankfully, an update made to the game in September 2016 lets you pick a Pokemon Buddy and walk along with them to earn Candy. Here's how to pick a Buddy, and how much Candy you get for every kilometer you walk with your buddy. Make sure you are always incubating Eggs in your available incubators any time you walk around with the app open. The benefit of hatching Magikarp from an Egg is that they seem to come with a higher Candy reward, allowing you to reach the 400 Candy requirement a bit faster than you would with another species. Once you have accumulated a boatload of Magikarp, calculate how much more Candy you need, and transfer any low CP Magikarp back to the Professor to make up the difference. When you have enough Magikarp Candy, evolve your highest CP Magikarp to ensure the resulting Gyarados is as strong as possible. Tagged with Guides,	Larryn Bell,	Niantic.